As of the end of 2018, 29 states and the District of Columbia (DC) had renewable portfolio standards (RPS), polices that require electricity suppliers to supply a set share of their electricity from designated renewable resources or eligible technologies. Although no additional states have adopted an RPS policy since Vermont in 2015, Connecticut, New Jersey, Massachusetts, California, and the District of Columbia extended their existing targets in 2018 or early 2019, continuing a trend in recent years across the United States. States with legally binding renewable portfolio standards collectively accounted for 63% of electricity retail sales in the United States in 2018. In addition to the 29 states with binding RPS policies, 8 states have nonbinding renewable portfolio goals. Connecticut increased its overall RPS target in May 2018 to a 48% renewable generation share of electricity sales by 2030, up from the previous target of 27% by 2020. The target requires at least 40% of electricity sales to come from traditional renewable technologies such as solar, wind, fuel cells, wave, tidal, most biomass technologies, and small run-of-the-river hydropower; up to 4% from additional waste-to-energy technologies; and 4% from combined heat and power systems. 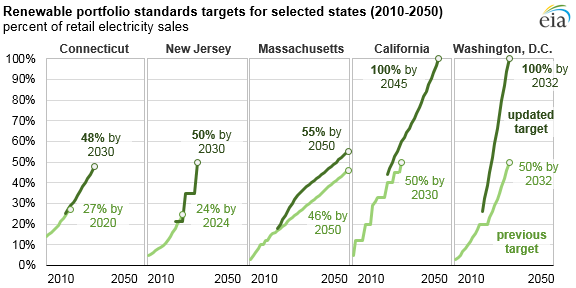 Also in May 2018, New Jersey increased its RPS target to 50% of eligible generation share of sales by 2030, an increase from the previous target of 24.4% by 2024. Under the new target, New Jersey moved from a gradual year-over-year increase to three separate targets of 21% by 2021, 35% by 2025, and 50% by 2030. New Jersey also requires that a certain percentage of the overall target must be met with solar technologies. Under the previous target, the solar-specific target slowly increased each year to 5.1% of total electricity sales by 2021. The new target still aims for 5.1% by 2021, but then it gradually falls to 1.1% of sales by 2033. In August 2018, Massachusetts increased its overall RPS target to 35% of sales by 2030. Massachusetts' target increases an additional one percentage point per year with no stated expiration date, replacing the earlier target of 18% by 2022 that increased an additional one percentage point per year with no stated expiration date. Massachusetts also provided for a $67.70 per megawatthour (MWh) alternate compliance payment that qualifying electricity providers may pay as an alternative to buying electricity generation from eligible sources to meet the RPS requirement. In September 2018, California increased its RPS target to a 60% renewable generation share of sales by 2030 and an additional 40% generation share of sales of carbon-free resources by 2045, for a total of 100% carbon-free power by 2045. The previous target was 50% renewable generation by 2030. The target revision makes California the second state to have a 100% clean energy target, following Hawaii, which set the requirement in 2015. California has the second-highest retail sales of electricity of all states, behind only Texas. In January 2019, the District of Columbia (DC) increased its RPS target to a 100% renewable share of sales by 2040, revising its previous target set in 2016 of 50% by 2032 and making DC the third in the United States to pass an overall RPS target of 100%. The DC RPS is separated into two tiers. One tier includes electricity generated from solar, wind, biomass, geothermal, fuel cells, tidal and wave, small hydro, and some qualified waste technologies. The second tier is specifically for solar technologies. The 100% by 2040 target requires that 10% of the target be met with electricity generated from solar technologies, up from the previous target of 5% by 2032.